Please try to ignore my disgusting un-pedicured feet - I hope to get that fixed today. 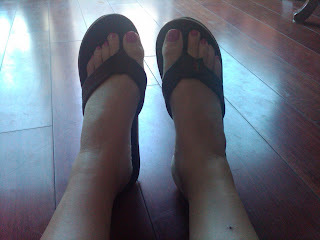 Anyway, in case you can't tell, the above picture is demonstrating what I encountered when I got off the plane: cankles. CANKLES. Apparently my pregnant body hates flying, because I was SO SWOLLEN when I got off the plane. I couldn't stop staring. Seriously, my toes look like sausages and I have cankles. The joys of pregnancy! I propped my feet up and drank lots of water so they are looking a little better, praise the Lord - how embarrassing. Now if I could just get over this jet lag, I would be in great shape - it has not been easy on my pregnant body.